Anyone who has been to my moms house knows of her incredible talent for decorating. Her halloween house is awesome and I wanted to share it. 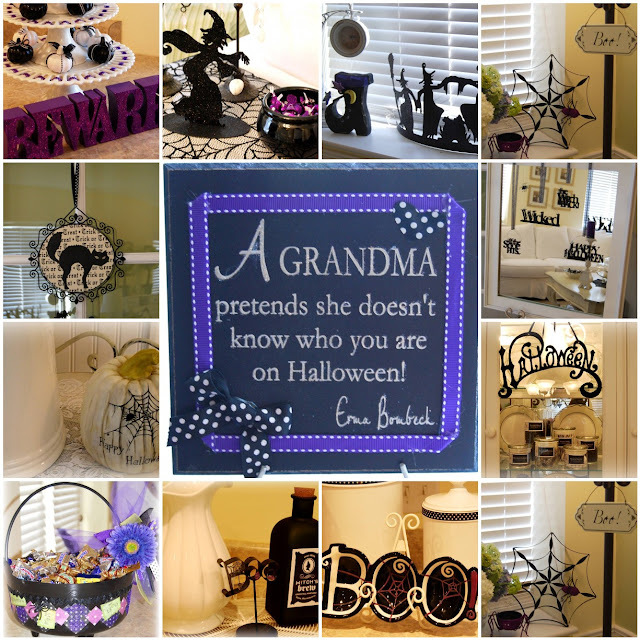 She throws the best halloween party for her grandchildren that live near. They look forward to it all month and love to come see her house all festive. You will love it too. It is darling, I can attest to that. Everything is perfectly color coordinated with her regular decor. Each item item is unique, and it's hard to keep my 18 month old from tearing it all apart! Super cute. 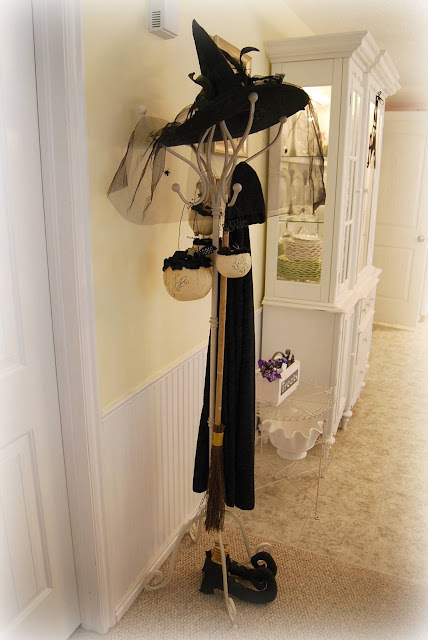 I especially love the witch accessories on the coat rack. Holy moly!!! That is amazing. She is incredible! Amazing! You have to be sure to post Christmas pics, this was always my favorite at the Foutz house! The entire house was color coordinated including the tree trimmings and wrapped presents underneath! You could have a full time business decorating Susan! Her place is magical. What a woman!! 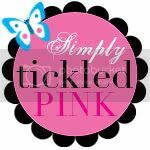 Thanks for commenting on my blog about the hobby lobby find- that made my day. I love mt mom, but can I borrow yours! What more can I say about your mom? Wow. Your mom is so classy, and you're so good at taking those pictures Jane. I love them both. Amazing! She is a great decorator! How fun. 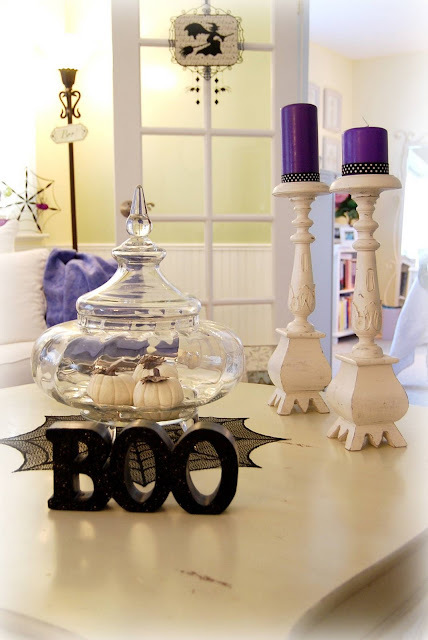 Your mom's decorating is amazing! Can I hire her? Glad you had such a fun girls weekend.. sounds like my kind of weekend.! 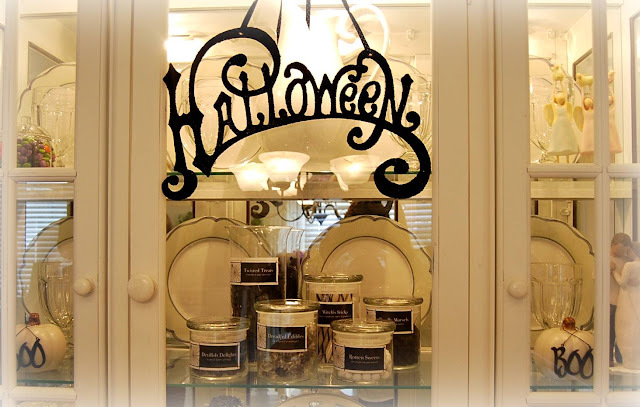 I especially love the jars with creepy candy titles on them. There are 2 houses in my neighborhood that hired lighting companies to come decorate their exteriors for halloween! They are sooooo overboard, it's hilarious. What would I do if I had the money to do that?